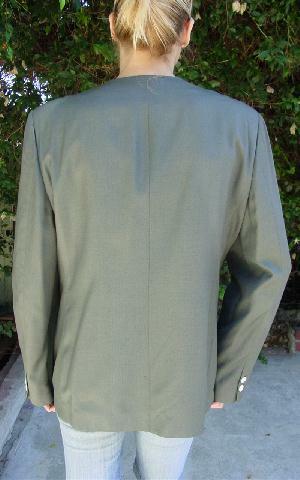 This dark grayish-olive double breasted jacket (feels like a wool-silk blend) is a vintage Burberry's and was originally sold at Bullock's department store. It has a synthetic offwhite lining. There are shoulder pads and long sleeves, and it is collarless. It has a 14 1/4" V neckline and lower slit pockets. The right one is still sewn shut. 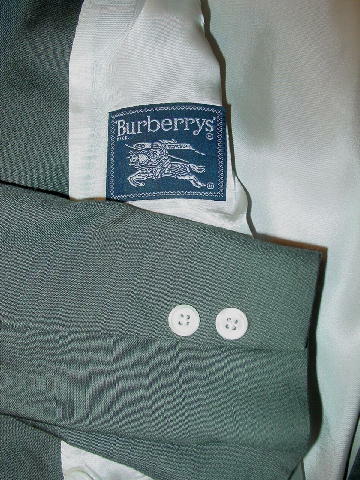 It has four exterior white buttons, one interior button, and 2 white buttons on each long sleeve. It's from a larger size New York model.